Tuscany-based woodworker, Andrea Brugi, teaches 20 approachable carpentry projects that don’t require complicated tools, and can be done in the home. Using some simple techniques, Samina Langholz and Andrea Brugi teach you how to make 20 beautiful wood objects for the home. Amongst the projects are an egg cup made from a reclaimed beam and broom handle, and a chopping board featuring a hand-carved ‘butterfuly’ – an old trick for stabilising a crack. Samina and Andrea live and work together in the small Tuscan village of Montemerano. Inspired by the rustic lifestyle of rural Italy and the unspoiled views of olive groves that surround them, they make beautiful carpentry pieces. Each signed and made by hand, their products are sold worldwide through outlets such as Goop and Eataly, as well as their own online shop andreabrugi.com. 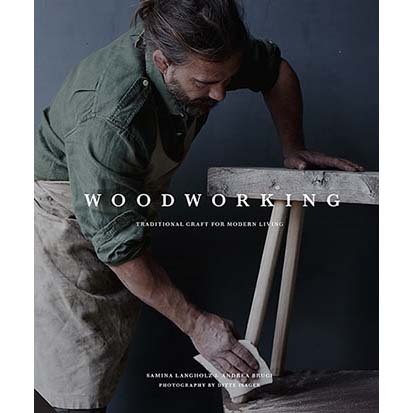 Accompanied by stunning location photography and accessible instructions, Woodworking cannot fail to inspire you to create the objects within.